As it’s located close to where the first Tunisian course opened in the 1920s at nearby Carthage, it could be said that golf in this part of the world truly returned to its roots with the opening of the 18-hole championship layout at The Residence Tunis in 2008. The two courses may sit a few miles from each other but, in truth, they also lie at completely opposite ends of the golfing spectrum. The Golf de Carthage course stands for the game of golf as it was played in a bygone era (despite a redesign by Yves Bureau in the 1990s) and its layout still measures less than 5,000 yards in length with not a single par five hole on the scorecard. On the other hand, The Residence Tunis represents modern, state of the art, golf with all the refinements that one would expect from a contemporary Robert Trent Jones II design. 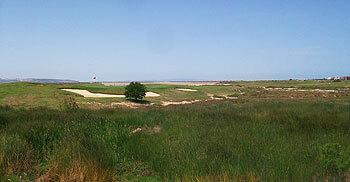 Lying conveniently close to Tunis-Carthage International airport on salt flats beside the up-market resort of Gammarth, the course is a plush golfing playground for guests residing in the attached five star hotel of the same name and its presence on the Tunisian golfing map has catapulted the game in this country right up to date in the 21st century. Fairways are laid out as two returning nines with back-to-back par fives – “Tenacity” and “Courage” – routed either side of a small lake at holes 3 and 4. Unusually, holes are configured as a trio of par threes, fours and fives on the outward half with the short 7th a real feature hole beside the salt lake. Holes 12 to 14 skirt the same stretch of tidal water before the round concludes with a long par five that doglegs left to the home green. I have to agree with Jim McCann. I was expecting a bit more and the first few holes are very much bounded by house and make it rather banal. then it opens up and becomes a much more interesting track. The course was in good condition. The clubhouse was good and friendly. Surprisingly in an Arab country there is a lady Pro. 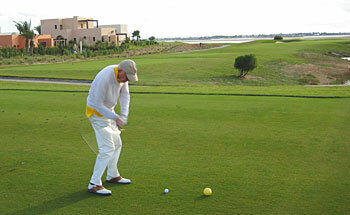 This course is worth playing if you are staying in Hammamet, but not worth making a trip to Tunisia. Having preceded my round here with games at El Kantaoui (Sea), Yasmine Valley and Citrus (La Forêt), I was looking forward to ending my short golfing tour of Tunisia on a real high with a links match beside the sea. Unfortunately, the course didn’t quite live up to my (admittedly high) expectations. It’s a crying shame that real estate encroaches to the extent that it does on the front nine holes because the very close proximity of the housing units on such a flat landscape is such a distraction. There’s something of a 3-hole respite from the residential element between the 5th and 7th holes along the sandy salt lake but the abiding memory of the front nine is one cast in concrete, I’m afraid, and I can only hope the addition of some peripheral vegetation will soften the surroundings over time. The back nine is more what I was expecting, beginning with a very difficult stroke index one par four (our group of four scored one stableford point between us and we all received a handicap stroke at this hole).The views across the marshes and tidal inlets are simply stunning on the inward half and you’ll see and hear plenty of different types of bird in and around the fringes of the fairways. Holes 12 to 14 are easily the best on the property, played out along the salt lake again, before the routing turns for home to wind its way in a somewhat contrived manner round a few inland ponds en route to the clubhouse. I’d love to be more enthusiastic about Le Residence as it’s a first class golf complex, beautifully conditioned and presented – I just think that helping to fund the facility via the property lots on the front nine was too much of a golfing compromise. We played 3 rounds and the two caddy masters could not have been better. It was service with a smile and whilst we worried about the language it was not a problem. The Residence hotel is less than 5 minutes from the club and they offer a shuttle. Bags all looked after by concierge or the Caddy masters. The first few holes not the strongest as you weave through some development but then you are suddenly confronted with some simply stupendous holes with suitable names which include some nerve jangling drives. Interestingly lunch was brought out to us as we played including cold beers. Having done Druids Glen, Monte Rei, La Reserva, Kingsbarns, Royal Columbo and quite a few others The Residence is right up at the top and if you are a golfer and travelling in Tunisia its a chance not to be missed. PS the local wine served at the hotel was excellent because of the historical French influence.